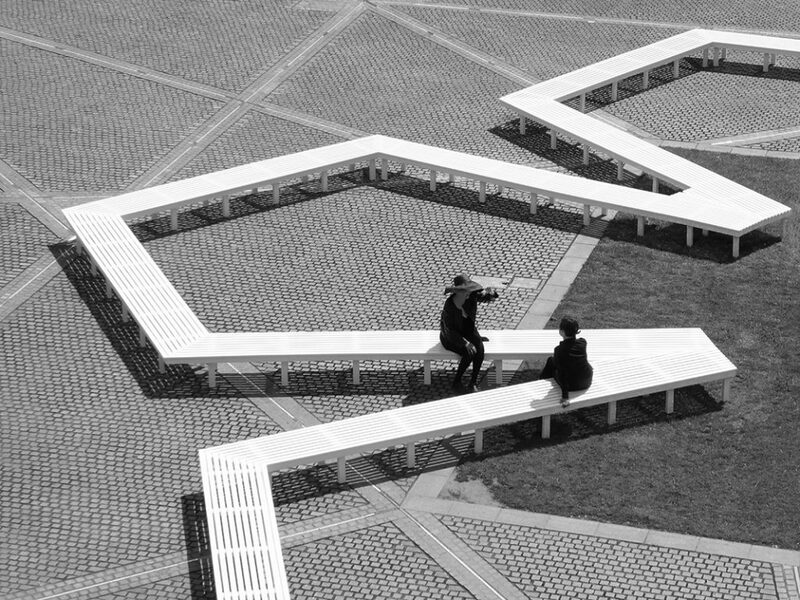 Pentagon Petal is an installation project by artist Fran Cottell and architect Marianne Mueller inviting the public to informally interact with a work which reflects on the complex and remarkable history of the college site and its Rootstein Hopkins Parade Ground outdoor exhibition space. 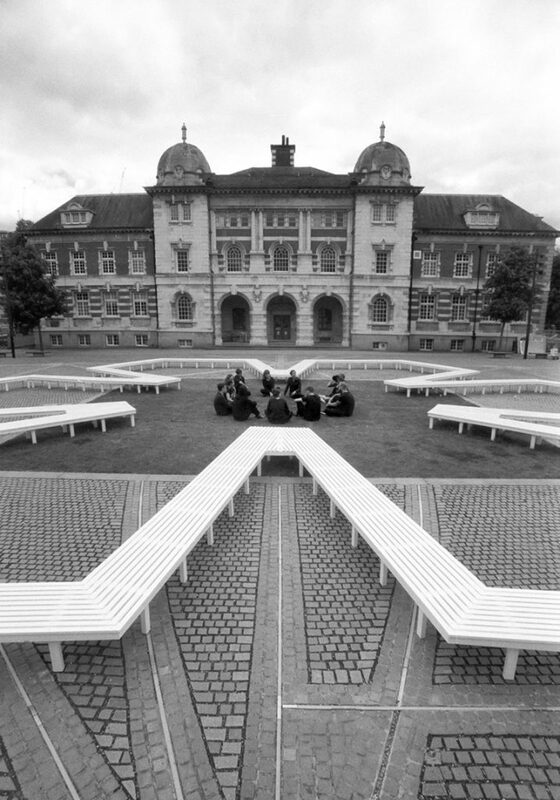 The intervention re-enacts a scaled version of Millbank Prison’s plan, editing and reinterpreting it into a more socially active figure: a 120 meter long flower shaped bench. Since the late 18th century, this location on London’s Millbank has acted as the dream site for Jeremy Bentham’s experimental ‘panopticon’, the actual home of the Millbank Penitentiary which was a military parade ground and now university campus, outdoor gallery and thoroughfare to Tate Britain. 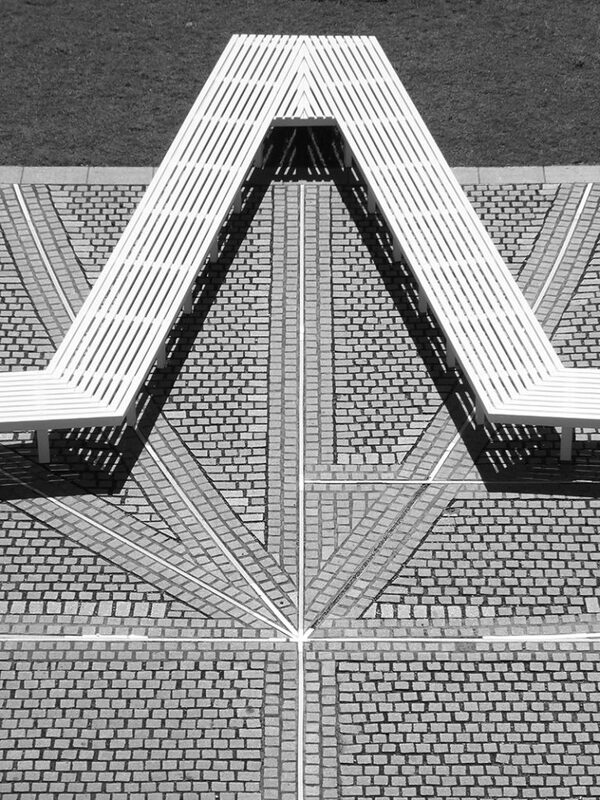 For Cottell and Mueller, the social history of the Rootstein Hopkins Parade Ground represents a cross section through architecture’s power to orchestrate social modes, ranging from solitary confinement to the military organisation of a group as a single unit, through to today’s neoliberal forms of sociability. 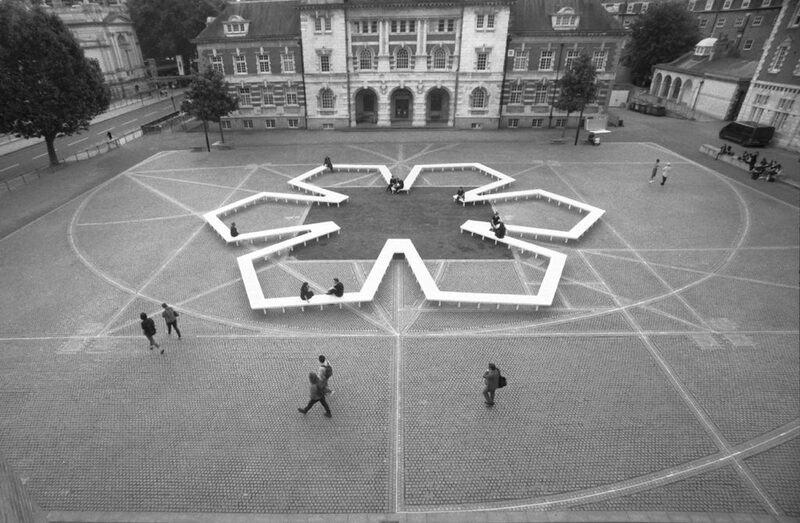 Generating and disrupting the social activity framed by the public square at the heart of Chelsea College of Arts, UAL, each of the piece’s six pentagons or ‘petals’ – originally shaped to facilitate social control and designated for solitary confinement – will now invite informal gathering. 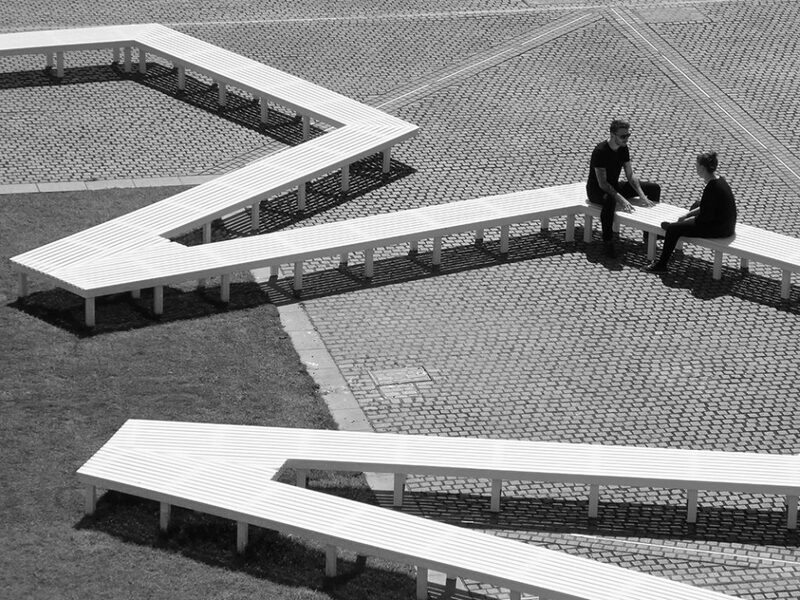 The intervention plays with ideas of exclusion and segregation while creating a generous, inviting place within the larger square. 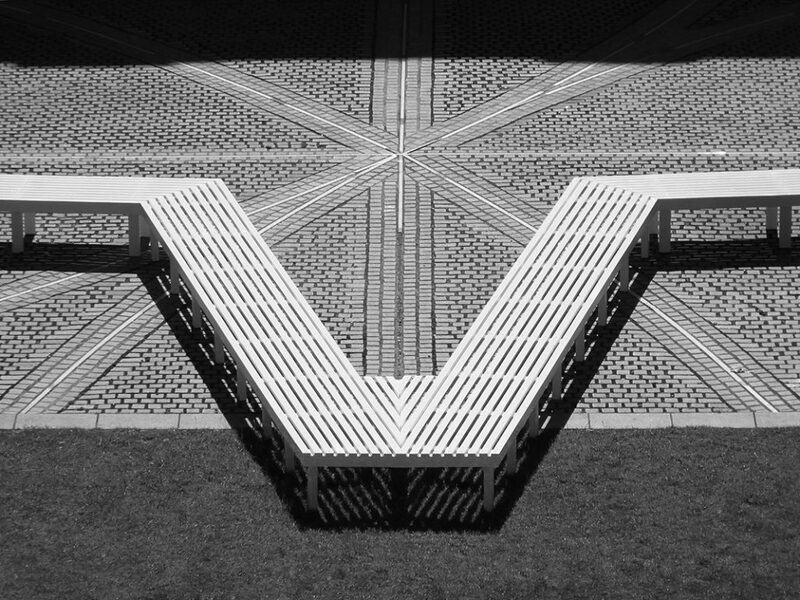 This project builds on a series of previous intervention projects by Fran Cottell and Marianne Mueller into domestic and institutional spaces for CGP London and the Architectural Association; the focus shifting from a relationship between visitors and inhabitants to between moving and static participation, occupations and activities to more unpredictable conditions and outcomes. The project is supported by Camberwell, Chelsea and Wimbledon (CCW) Colleges of Arts, CCW Graduate School Staff Fund, UAL Careers and Employability and Brewers Decorator Centres.